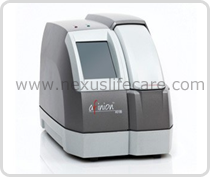 Afinion™ AS100 Analyzer distributors, dealers & suppliers in Mumbai, India. Product Description:- It is a Multi Assay Analyzer System for HbA1c, ACR and CRP. The Afinion™ AS100 Analyzer is designed to enable simple and fast on-the-spot testing, regardless of the sample type, which may be whole blood, plasma or urine, and to deliver accurate results during patient consultation for improved patient management.